Remove the engine front cover. Refer toEngine Front Cover Replacement.Remove the spark plugs in order to ease crankshaft/enginerotation. Refer toSpark Plug Replacement.Remove the right bank secondary camshaft drive chaintensioner. Refer toSecondary Timing Chain Tensioner Removal - Right Side.Remove the right bank secondary camshaft drive chain shoe.Refer toSecondary Camshaft Drive Chain Shoe Removal - Right Side.Remove the right bank secondary camshaft drive chain guide.Refer toSecondary Timing Chain Guide Removal - Right Side.Remove the right bank secondary camshaft drive chain. RefertoSecondary Camshaft Intermediate Drive Chain Removal - Right Side.Remove the primary camshaft drive chain tensioner. Refer toPrimary Camshaft Intermediate Drive Chain Tensioner Removal.Remove the primary upper camshaft drive chain guide. Refer toPrimary Timing Chain Guide Removal - Upper.Remove the primary camshaft drive chain. Refer toPrimary Camshaft Intermediate Drive Chain Removal.Remove the right bank camshaft intermediate drive chainidler. Refer toTiming Chain Idler Sprocket Removal - Right Side.Installation ProcedureEnsure stage 1 camshaft timing is correct. 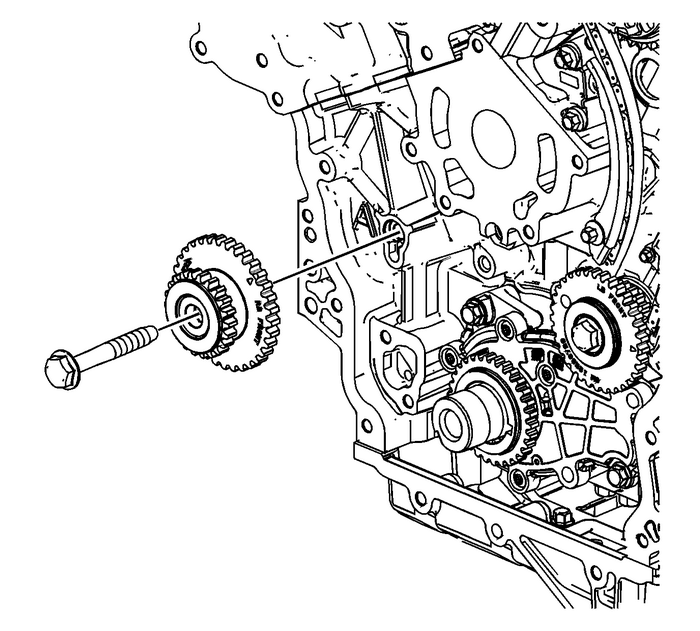 Refer toSetting Camshaft Timing. Install the right bank camshaft intermediate drive chainidler. Refer toTiming Chain Idler Sprocket Installation - Right Side.Install the primary camshaft drive chain. Refer toPrimary Camshaft Intermediate Drive Chain Installation.Install the primary upper camshaft drive chain guide. RefertoPrimary Timing Chain Guide Installation - Upper.Install the primary camshaft drive chain tensioner. Refer toPrimary Camshaft Intermediate Drive Chain Tensioner Installation.Install the right bank secondary camshaft drive chain. RefertoSecondary Camshaft Intermediate Drive Chain Installation - Right Side.Install the right bank secondary camshaft drive chain guide.Refer toSecondary Timing Chain Guide Installation - Right Side.Install the right bank secondary camshaft drive chain shoe.Refer toSecondary Camshaft Drive Chain Shoe Installation - Right Side.Install the right bank secondary camshaft drive chaintensioner. Refer toSecondary Timing Chain Tensioner Installation - Right Side.Install the spark plugs. Refer toSpark Plug Replacement.Install the engine front cover. Refer toEngine Front Cover Replacement.